Vincent Price stars in this impressive Roger Corman directed AIP Horror film based on a classic of Edgar Allan Poe. MGM USA R1 DVD. as the shades of the evening drew on, within view of the melancholy House of Usher. a sense of insufferable gloom pervaded my spirit." Philip Winthrop (Mark Damon) arrives at the House of Usher, he announces himself as the fianceé of Madeline Usher. He is greeted by her brother Roderick (Vincent Price), who tells Philip of the terrible aflictions that have beset the Usher clan and urges him to leave. Driven by his love for Madeline, Philip insists on staying and tries to take Madeline back home with him, but he soon discovers the oppressive atmosphere over the place and Roderick tells him of its ghastly origins. The Fall of the House of Usher was the first of a series of gothic horror pictures. In the late 1950s AIP (American International Pictures) were establishing themselves as producers and distributors of low budget and independent pictures. Director Roger Corman became a company favourite - able to shoot effective films in just a few days and on a tiny budget he helmed a variety of projects, including the 'classic' Attack of the Crab Monsters (1957) which epitomised AIP's output at the time. In 1960 the producers again asked Corman to shoot a pair of cheap black and white horror films, instead he suggested that they pool the money to make one larger scale gothic horror film, the genre becoming very popular at the time thanks to the British Hammer Films company. While the English studio was busy remaking Universal's monster movies, Corman suggested the work of Edgar Allan Poe - Universal in the 1930s had briefly explored Poe's work, and it had name recognition all over North America, but most importantly was public domain and thus free for the picking. The script was adapted by writer Richard Matheson (best known for his novel I am Legend) from the classic and most popular of Edgar Allan Poe's short stories. Although the general ambience of the story is similar to Poe's book, Matheson has made a number of major changes to the story - most importantly the film's key romantic theme was an invention of the script and is not in the novel. Fortunately this element does not seem tacked on, like in so many stories, but is very well written into the highly unsettling atmosphere of the Poe framework. The dialogue is similarly well written, with beautiful use of classical language. Only a few slight blemishes (in particular the awkward references to the ancient house being located in America and moved across from England) threaten to spoil this otherwise very well written film. Pacing is relatively sedate, slightly slower than most of the equivalent Hammer and Universal horrors but although mostly dialogue based, the story builds well and unexpectedly with an effectively scary atmosphere, to its impressive climax. The film has the general ambience of a Hammer film, with some very nice looking sets. Roger Corman, working with cinematographer Floyd Crosby, makes good use of tracking shots and some strange angles. The use of a cinemascope frame might seem unnecessary for a completely studio-bound production, but Corman does use it to create some nice visual compositions that have been subsequently mauled by years of fullscreen TV prints. The editing is surprisingly effective and the most impressive scene is a surreal, colour tinted dream sequence. AIP regular Les Baxter provides a nice orchestral soundtrack that for the most part sounds like a standard James Bernard Hammer score, but has some strange avant-garde vocals towards the climax that really help to underscore the unsettling atmosphere. Vincent Price had a heritage of horror dating back to the later Universal Horror films, his second leading role was in The Invisible Man Returns (1940), although spending most of the 1950s in television, with the re-rise of cinema horror in the late 1950s he returned to the genre with a lead role in the classic House on Haunted Hill (1959). The immediate first choice for the role of Roderick Usher, Price does not disappoint, with his distinctive voice giving a wonderful gravitas to the dialogue. His usually dark hair was dyed white for the role to give him an aged and dignified appearance, although for fans of the actor it does seem rather odd. For most of the film there are only three other cast members, Mark Damon (who made a career in Italian exploitation cinema and is now a Hollywood producer), Myrna Fahey who made few other films of note, and Harry Ellebre as the butler, who is similarly unknown although with a minor role in Corman's later Haunted Palace (1963). 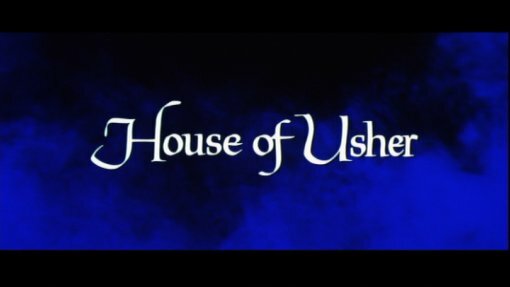 The Fall of the House of Usher is a very good gothic horror film, Richard Matheson's script is highly effevtive, keeping the atmosphere of the Poe story, while adding a more compelling and filmic storyline. Combined with Corman's surprisingly good direction, Vincent Price's classic performance, some nice sets and a strong soundtrack, you get a horror film to rival anything that Hammer were putting out, and far better than Universal's Poe misfires of the 1930s. The film inspired a long series of AIP Horrors that mixed and matched Corman, Poe and Price, but rarely equalled this first production. Certainly recommended to fans of Poe or Price, and fans of the Hammer and Universal Films will probably enjoy this. Generally recommended and a great starting place for exploring the AIP gothic horrors. Directed by anyone interesting? Roger Corman - most famous for producing hundreds of low budget horror and sci-fi films, he made a name for himself as a director on the AIP gothic horrors including Premature Burial (1962). Is it scary? A very strong atmosphere that should prove scary if watched properly. Who is it for? Highly recommended to Poe and Price fans. Fans of the classic Hammer and Universal gothic horror films will probably enjoy this. The print quality is good, colours and detail are strong although there is general speckling and noticable grain throughout. Audio English language original mono sound. Very strong and clear. Audio commentary from Roger Corman. Although a solo track, this flows well with a chatty nature and lots of interesting information. Availability Previously available as a single disc release, now only available in a double-bill pack with the Pit and the Pendulum DVD on a dual-sided disc. Part of the MGM Midnight Movies series. Other regions? A British R2 release, lacks the audio commentary. Cuts? Fully uncut. English language print. A very atmospheric and scary gothic horror film with impressive directing and a great lead performance. Recommended. A good looking presentation of the film with an interesting audio commentary track. Find more films starring Vincent Price and directed by Roger Corman. All text in this review written by Timothy Young - 1st September 2006.